This huge water buffalo with a farmer at it's back is the first thing you will see at the entrance. GAP is probably dubbed as Land of Promise because it promises an unforgettable experience once you choose to spend time and visit the farm. With today’s entrance fee of only 30.00 pesos per person (not quite a buck) JK and I were able to experience few hours, a taste of rural farm life with a bit of education. I was wowed especially with its huge changes. Imagine I was only a teen when I last saw the place. If you’re up to experience combined nature and learning especially the Philippine culture and a little bit of its history, this is a perfect place to be. The abundant varieties of trees, flowers and plants are sights to behold. 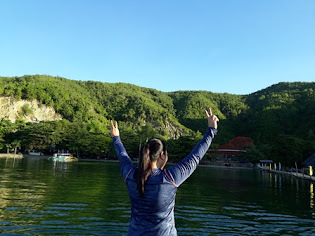 They also have picnic spots that cater visitors that come whether in small or a large group, an inviting swimming pool where you can relax, a decent restaurant that serves good Filipino foods, a souvenir shop and a lot more. Plus they got WIFI too now! A vast lawn of various fruit trees. 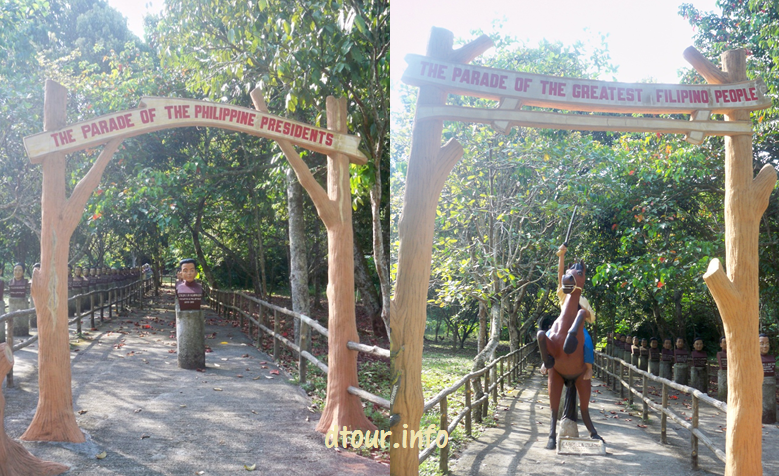 The parade of the Philippine Presidents and the country's great people. The parade of both tamed and wild Philippine animals. That's JK... making pose with the bat. If not for keepsake, I'd rather not climbed up this tree house.It feels eerie to me. Additionally, hopping from one attraction to the next is convenient when you’re already at the place. When coming from the North Outland Adventure and Zip City – two of the famous Ziplines in the city are not too far away from the farm. In fact, JK and I just walked it through from the Outland Adventure where we’ve had an awesome Zipline experience a month ago. (See video of our Zipline here.) Also if you plan to visit Philippine freshwater crocodile conservation area, the Crocodile Park is only few minutes away too from Gap Farm. It’s really nice to have visited again after a long time. We had such a great time. Indeed it was a refreshing and relaxing time well-spent at the farm!